Ida Lupino was a central figure in the breaking of the all-male lock on the Hollywood director’s chair. While she was looking for a new project to make with her then-husband Collier Young, she met one of the men who had been kidnapped and forced to drive through Mexico by spree killer Billy Cook. 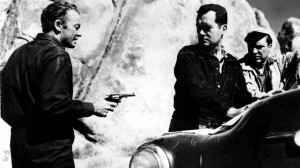 That inspired her (and co-screenwriter/producer Young) to make this week’s film recommendation, the first film noir directed by a woman: 1953′s The Hitch-Hiker. The plot is straightforward and crisply told. Wonderfully, there is none of the extended, needless expository “set-up” of the characters and story of which too many film makers are enamored. Rather, the movie opens with a solitary figure walking slowly along a highway, looking for a ride. His face is off-camera. A car stops to pick him up, and moments later we see the same car on a dark side road, with dead bodies next to it. The solitary figure, face still obscured, harvests wallets and jewelry from the corpses. And then we see two pals on a fishing trip pick up a hitchhiker, who draws a gun and tells them to drive to Mexico. Somewhere along the way, he announces blandly that he is going to kill them too. 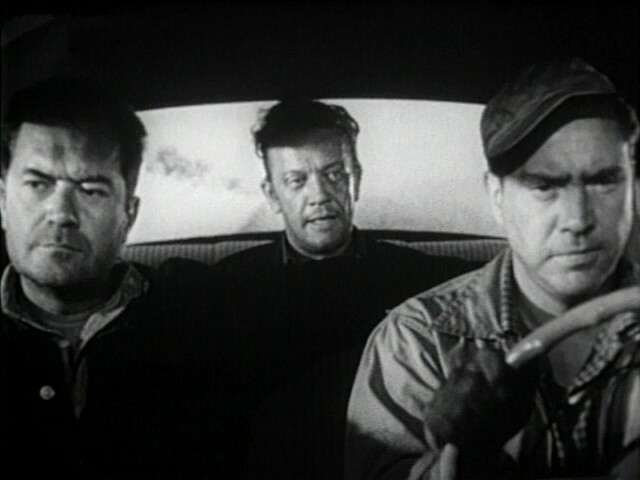 From there, the movie is a three-handed nail biter, with William Talman as the hitchhiker and Frank Lovejoy and Edmund O’Brien as the luckless captives. Lupino keeps the brutal tale moving quickly and tells it an unromantic, unadorned style reminiscent of one of her mentors, Raoul Walsh. Like most people, I only knew William Talman as the Prosecuting Attorney who got his head handed to him every week by Perry Mason. But there was more to the man than the role of Hamilton Berger let him show. As the gun-toting, sadistic Emmett Myers, he’s truly chilling. Yet like most bullies, he conveys an undercurrent of weakness and fear. It’s a pity Talman’s addiction to tobacco took him away from us at such an early age, leaving The Hitch-Hiker as the only big screen work for which he is even occasionally remembered. O’Brien is credible as the more macho of the kidnappers, who chafes at Talman’s psychological terrorism and keeps looking for a way to confront him. But the more complex performance is by Frank Lovejoy, whom Lupino seems to have coached to play his part more like O’Brien’s wife than friend. He cooks, he tends injuries, he loves children, he counsels patience and he better endures Talman’s taunts that the captives are soft and unmanly. Yet when the need arises, Lovejoy is heroic. I wonder if Lupino saw herself this way. In any case, I doubt that a male director/scriptwriter would have crafted Lovejoy’s part in this complex and compelling fashion. The film is also a master class in noir cinematographer, with Nicholas Musuraca behind the camera. The eerie shots of Talman’s menacing face floating in the dark in the back seat with the two terrified captives harshly lighted and staring at the camera are unforgettable. But Musuraca also puts paid to the idea that film noir camerawork has to be all about shadow. Noir is a mood and not just a lighting style. The lonely, glaring shots of the car rolling through the bleak desert utterly isolated under the burning Mexican sun are just as much iconic noir as are all the dark scenes. Musuraca is revered in film noir uber-buff circles, but not widely respected beyond that, perhaps because his oeuvre was so enormous that he inevitably worked on some zero-budget tripe. But with this film, the trend-setting noir Stranger on the Third Floor and his movies with Jacques Tourneur (also once unappreciated), he has the basis to accrue a stronger reputation over time. 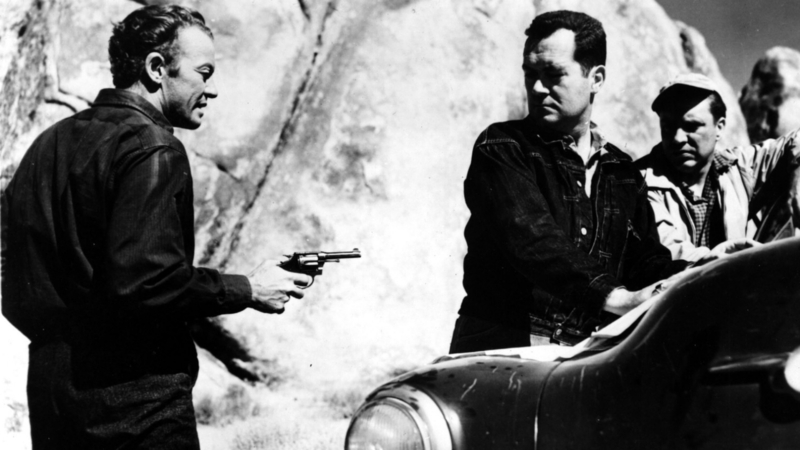 The Hitch-Hiker is a minor classic of the noir genre and a feather in the cap for Lupino, Young and everyone else involved. After this gripping movie, you may find yourself hesitant to ever again slow down and pick up that guy with his thumb out on the side of the road.